The Flameshielde Mini Fire Door is manufactured to a nominal thickness of 37 mm to suit both new installations and replacement doors. The Building Code of Australia requires that all entry doors in residential buildings, apartments and hotels require a fire rating of one hour. The Flameshielde Mini Fire Door is especially suited to meet this requirement. Notes applicable to this approval. Door finished thickness nominal 37 mm. Metal frame rebate size – 40 mm x 25 mm. Approved for use in masonry, plasterboard partition and Hebel walls (FCO-2872). Approved for up to 1 hour fire rating moulded panel HDF fire door (FCO-2668). Approved for up to 1 hour fire rated doorset faced with 6.0 mm thick MDF or faced with 5 – 6 mm thick MDF followed by an external facing of 0.5 – 1.0 mm thick decorative veneer (FCO-2772 – tested in accordance with AS 1530.4-1997). Approved for FRL of -/120/30 on maximum clearance of 20 mm between the bottom of the door leaf and the top of the non-combustible sill (FCO-2942). Approved for up to 2 hour fire rating using the KILARGO KG5102 Upgrade Perimeter Seal in conjunction with a metal frame rebate size of 40 mm x 15 mm (FSV1437). Minimum hinge requirement – 3 hinges. Hardware to be approved for TVC-Core Mini (Flameshielde Mini) fire door. Steel frame to be backfilled with concrete or mortar into Masonry wall; plasterboard strips and plaster into Plasterboard wall. Complies with AS 1905.1-2005 and tested in accordance with AS 1530.4-1997 & AS 1530.4-2005. Timber frame rebate size – 40 mm x 30 mm. Timber frame minimum dry density 650kg/m³ e.g. MDF or Tasmanian Oak. Approved for use in masonry and plasterboard partition walls. Complies with AS 1905.1-2005 and tested in accordance with AS 1530.4-2005. Door with steel capping (cladding) finished thickness nominal 39 mm. Steel Frame rebate size – 40 mm x 25 mm. 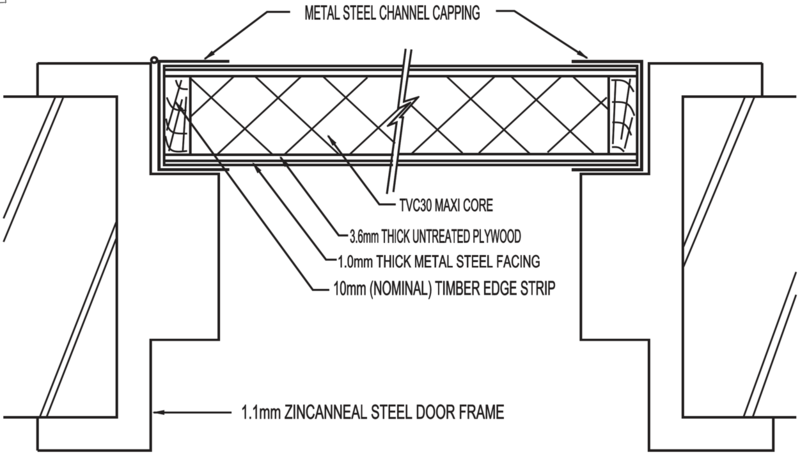 The minimum overlap of the face steel sheeting and the perimeter channel is 15 mm. The PVA glue used to adhere the plywood to the core and the contact glue used to adhere the steel sheet to the plywood. The perimeter steel channel is to be fixed to the face steel sheeting with pop rivets at minimum 500 mm centres. The 2 mm thick intumescent strips to be fitted between the steel channels and the 4 edges of the door leaf. Minimum hinge requirements: 3 hinges. The hardware to be approved for TVC-Core Mini (Flameshielde Mini) fire door. Steel frame to be back filled with concrete or mortar into Masonry wall. Complies with AS1905.1-2005 and tested in accordance with AS 1530.4-1997 & AS 1530.4-2005. Standard door finished thickness nominal 37 mm door leaf. Steel frame rebate size 40 mm x 25 mm. Steel frame to be backfilled with concrete or mortar into Masonry wall, plasterboard strips and plaster into Plasterboard wall. Complies with AS 1905.1-2005 and tested in accordance with AS 1530.4-1997 & AS 1530.4.2005. The following codes identify the type, size and finish of the Flameshielde Mini Door to be quoted or ordered. The maximum door size permissible in 37 mm thick (Flameshielde Mini Door) is 2400 mm h x 1200 mm w.
Should the door size you require be greater in either height or width than the maximum permissible size, then select from the Flameshielde Maxi Door (47 mm thick) door range.